Timo, rosmarino e menta q.b. Si consiglia di far eliminare le interiora del rombo direttamente dal pescivendolo. Sciacquate il pesce sotto acqua corrente fredda; girate il pesce dalla parte scura della pelle (1) e con un coltello praticate un taglio all’inizio della coda per togliere la pelle: sollevate il lembo e tirate via la pelle delicatamente (2). Rivestite una teglia con carta da forno e adagiateci il rombo. Per la panatura, dalla pagnotta di pane ricavate la mollica che dividerete a cubetti (potete utilizzare anche del pane raffermo). Servendovi di un mixer, tritate la mollica insieme alle erbe aromatiche (prezzemolo, basilico, timo, rosmarino e menta), i filetti di acciughe, sale, pepe a piacere. Infine trasferite il composto in una ciotola (3-4), aggiungete un filo d’olio extravergine di oliva ed il succo di mezzo limone, mescolate il tutto fino ad ottenere un composto omogeneo (5). Spennellate la superficie del rombo con l’olio (6), successivamente versate la panatura su tutto il rombo con un cucchiaio. Guarnite il pesce con i pomodorini (7). Cuocete il rombo in forno per 10 minuti a 200° e poi 5 minuti in funzione grill a 230°. Se utilizzate il forno ventilato, cuocete per 10 minuti a 190° (9). 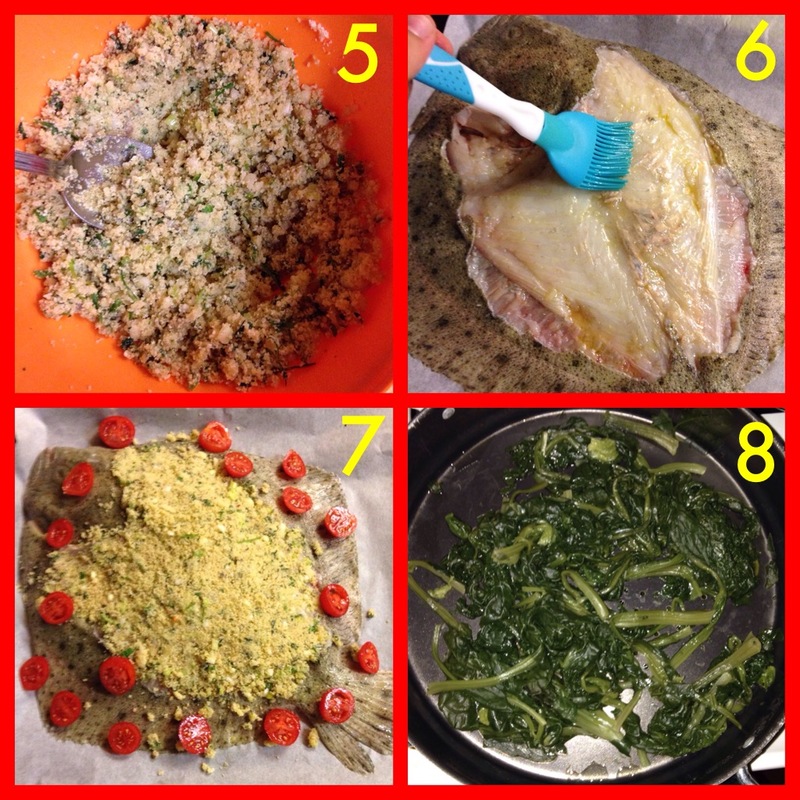 Per il contorno, pulite e lavate gli spinaci, saltateli in padella con uno spicchio d’aglio ed un filo d’olio (8). Ponete gli spinaci in un piatto capiente (10) ed adagiatevi un filetto di rombo appena cotto (11). It is advisable to remove the innards of the turbot fish directly by the fishmonger. Wash the fish under cold running water; Turn the fish by the dark side of the skin (1) and with a knife cut at the beginning of the queue in order to remove the skin: Lift the flap and pull off the skin gently (2). Use a baking sheet with parchment paper and put inside the turbot. For the breading, take from the loaf of bread crumbs that will be divided into small cubes (you can also use stale bread). Using a mixer, chop the breading with fresh herbs (parsley, basil, thyme, rosemary and mint), anchovy fillets, salt and pepper to taste. Transfer the mixture into a bowl (3-4), add a drizzle of extra virgin olive oil and the juice of half a lemon, mix together until mixture is smooth (5). 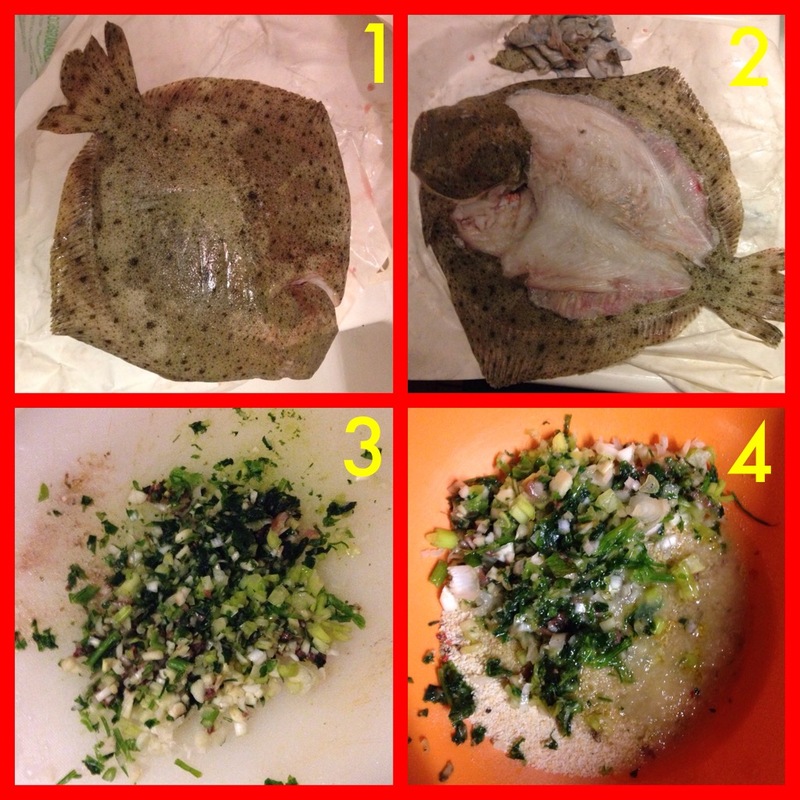 Brush the surface of the turbot with the oil (6), then pour the breadcrumbs all over the turbot with a spoon. Garnish the fish with tomatoes (7). Cook the turbot in the oven for 10 minutes at 200 ° and then 5 minutes at 230 ° turning on the grill function. If you use a ventilated oven, cook the fish for 10 minutes at 190 degrees (9). For the side dish, clean and wash the spinach, cook them in a pan with a clove of garlic and a little olive oil (8). 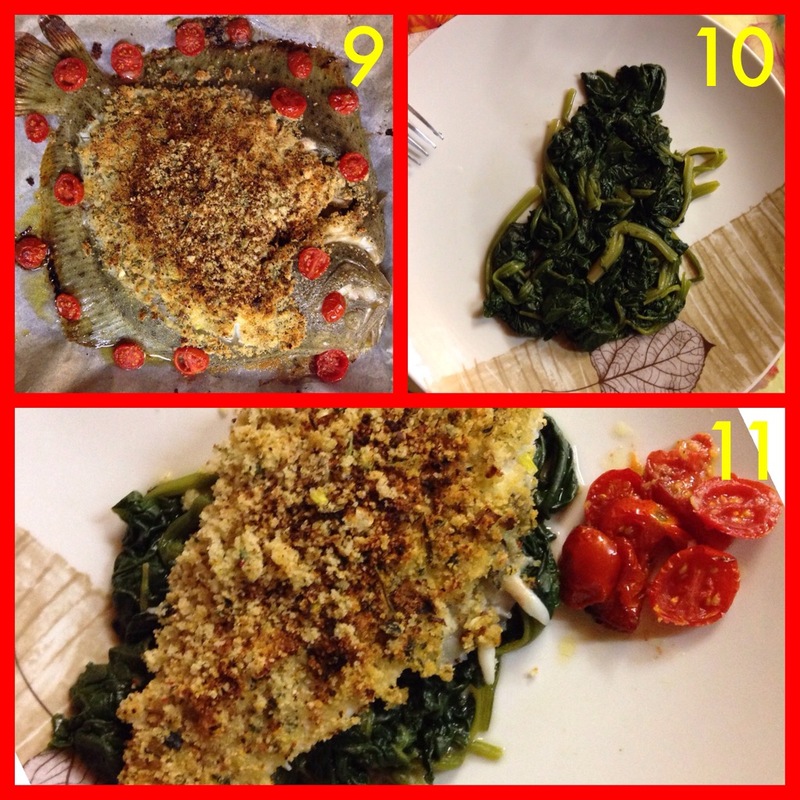 Place the spinach in a large plate (10) and put over the just baked fillet of turbot (11). This entry was posted in Secondi - Mains and tagged fish, pesce, rombo, turbot. Bookmark the permalink.